Until now, the secondary circuit in geothermal power plants, which is used in the Kalina process for the ammonia-water-steam generation at low temperatures, has always been protected by safety valves. 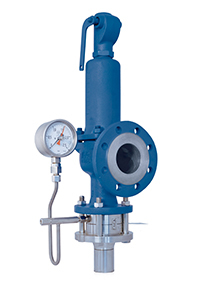 Due to the limited leak-tightness of re-sealable relief devices (safety valves) especially over longer periods of time, some operators have now begun installing rupture discs downstream from the safety valves. “The GT in the product name stands for geothermal,” Rüsenberg added. These rupture discs are used to secure a vast range of steam and condensate lines as well as condensers, evaporators and heat exchangers. By installing the rupture disc in a special holder on the process side of the safety valve, the valve will be protected from the process medium during normal operation. The KUB GT has a completely smooth surface on the process side. In combination with the corresponding holder, a metal-on-metal gasket is created, which guarantees a much higher leak-tightness than the use of a safety valve as a stand-alone solution would provide. Even if the Kalina process was primarily used by geothermal power plants, it is fundamentally also suitable for all processes that use corrosive, hazardous or polluting media and require a high degree of leak-tightness.